This is an update from a previous Hepatitis B Testimonial. 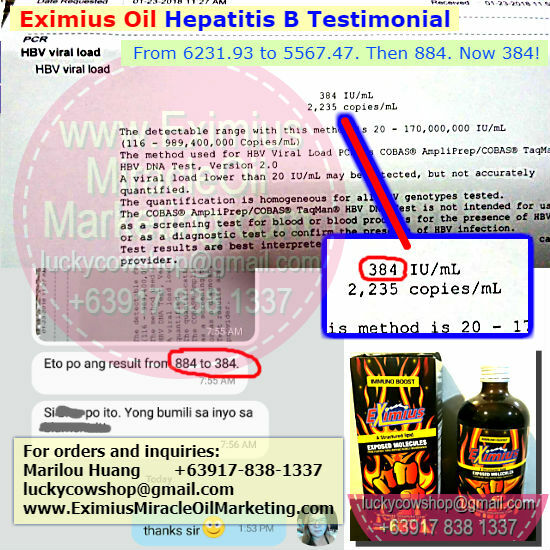 He continuously take Eximius Oil to lower down his Hepatitis B virus count. We are very glad of his result! From 6231.93 to 5567.47 to 884 (I do not have his lab result on this one) to 384! We are very happy with the result. We hope he would reach the cut off value soon so he'll be free from the Hepatitis B virus. Eximius Oil is a health supplement that can help people who has different kinds of health problem like high blood, low blood, low hemoglobin, kidney problem, liver problem, low immune system and other health conditions. Here is the laboratory result of one of the repeat check-up done by the buyer. If you know anyone who has Hepatitis B, or other kinds of health problem, do refer them to us. This product might be able to help them.